Right Kimo, no labels in these, probably not misstamped, I'll get ahold of spt, he owns a few of these too and would know the numbers. I have the Prairie Song Custom, D66SW and the Timber Ridge, D60SW, always thought the regular Prairie Songs were D61SW's. This one was indeed the D-62SW Prairie Song, the rosewood version of the D-60SW, and a plainer version of the D-66SW Prairie Song Custom. I believe this particular D-62 was a '78. In the following serie (with the double-triangle headstock), it seems the D-60/62/64/66 models disappeared from the line-up*. The only SW models left were the D-61SW and D-68SW. The D-61 is described in the archives as having rosewood sides and back although most (all?) have in fact ovangkol s&b. Starting in 1990, there were 2 more models added, the D-70SW and D-90SW. To the best of my knowledge, all the guitars mentioned here were Yamakis. * Timewise, the end of the Martin headstock serie and the beginning of the double-triangle serie has not been established with certainty although the first double-triangle model I know of seems to date back to 1983. 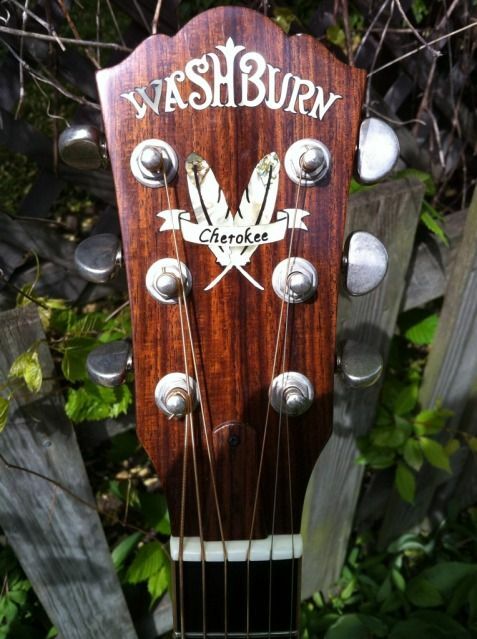 The official Washburn archives only go back to 1988. There seems to have been a few SW transitional models (between '83 and '88) that are so far undocumented but do show up once in a while. I decided to pass on it, having recently satisfied a GAS attack, but will keep an eye out for this series.